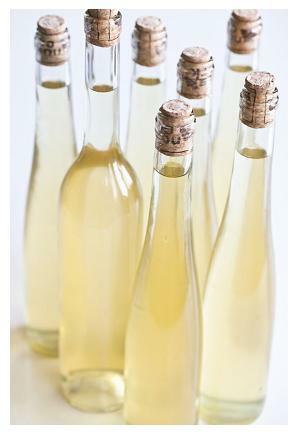 Try this Dandelion Wine Recipe. Dandelions kill grass. Yes, we know that. But they are also beautiful, and their greens are edible, and they make a lovely bouquet, and did you know you can make wine from the flower petals? Here is a simple, original American recipe for dandelion wine. Everyone loves to make this unusual concoction, but the taste of dandelion wine is not suitable to every palette. However, most wine enthusiasts try this recipe at least once just to be able to say they did. All wine recipes take practice and patience. A single batch of wine can take anywhere from a week to a year to make. Wine is generally aged according to how sweet (or dry) a flavor is desired. Pair this recipe with your next gourmet meal and see what happens. Place dandelion blossoms in the boiling water, and allow the flowers to boil for about five minutes. Remove the flowers from the water with a straining spoon and discard the dandelion blossoms. Let the water cool to about ninety degrees Farenheit. Pour the warm mixture into a plastic fermenting container and attach a fermentation lock. Let the wine ferment in a cool area until the bubbles go away. This process can take anywhere from ten days to two weeks. Siphon the wine out of the mixture. Strain the liquid through cheesecloth into a clean, sterilized container. Bottle the wine in sterilized canning jars with lids and rings. Age the wine at least a week for optimal flavor. For more great American favorite recipe ideas, visit any of the links shown on this page. Look here for the lowest rates on Car and Auto Insurance Premiums In All 50 States. Go here for colorful Fact and Photo Galleries from All 50 States. Go here for a list of all PhD Programs in All 50 States. Click here for Affordable Travel Deals everywhere in America.